At last year’s adoption center in Mill Creek, more than 70 dogs and cats found their forever homes. Photo credit: Community Cat Coalition. The 4th Annual Mill Creek “Home for the Holidays” Pet Adoption Center will once again open this year in the Mill Creek Town Center on Fridays, Saturdays, and Sundays through December 15, 2013. 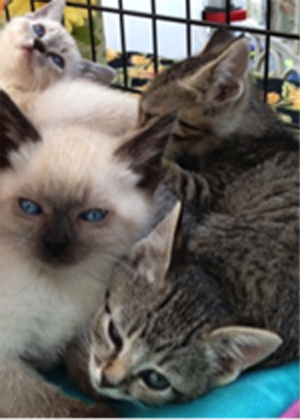 Paddywack pet supply store in the Mill Creek Town Center is the primary sponsor and will be working with volunteers from the Community Cat Coalition and FurKidz 911 to coordinate the activities. “Home for the Holidays” is a national pet adoption campaign that encourages those considering a pet to adopt from their local animal organization rather than purchasing a pet from a backyard breeder, puppy mill, or pet store. At last year’s adoption center in Mill Creek, more than 70 dogs and cats found their forever homes. At the “Home for the Holidays” Mill Creek adoption center, multiple non-profit pet rescue organizations will be on-site this year with adoptable pets every Friday, Saturday and Sunday from November 22nd through December 8th. The open house format for the center encourages families to visit with potential adoptees and learn about pet adoption and care. In addition, Artis Photography will be offering Santa Photos for families and pets Walk-ins are welcome, or an appointment can be made by contacting Artis Photography directly at 425-892-2495. A portion of the Santa photo proceeds will be donated to non-profit pet rescue.